Railpictures.ca - Dave Burroughs Photo: NYC 7431-5820-7430 on what I have labelled as the Starlight enroute from Agincourt to Aberdeen Yard in Hamilton. It is possible that this could also be an Ham Turn extra because it has extra flags flying. CP quite often sent the power that would be on the “Kinnear” train TF2 on an extra to Hamilton during the day. | Railpictures.ca – Canadian Railway Photography – photographie ferroviaire Canadienne. 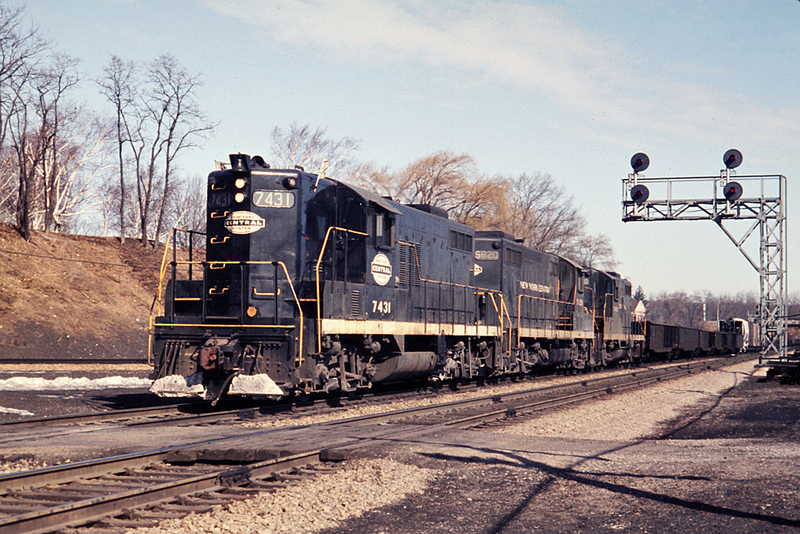 Caption: NYC 7431-5820-7430 on what I have labelled as the Starlight enroute from Agincourt to Aberdeen Yard in Hamilton. It is possible that this could also be an Ham Turn extra because it has extra flags flying. CP quite often sent the power that would be on the "Kinnear" train TF2 on an extra to Hamilton during the day. Arnold’s shots of the Starlight coming into Hamilton usually had some TOFC at the head end. Admittedly,AWM was shooting nearly a decade later so traffic patterns could have changed. Pretty much all trains were Extras at this time, both railways. With the sun half on the nose, it may be an Extra Hamilton in the late morning, early afternoon window.